A Comprehensive Course in Analysis by Poincaré Prize winner Barry Simon is a five-volume set that can serve as a graduate-level analysis textbook with a lot of additional bonus information, including hundreds of problems and numerous notes that extend the text and provide important historical background. Depth and breadth of exposition make this set a valuable reference source for almost all areas of classical analysis. 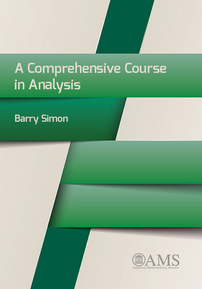 Get the Ultimate Companion to A Comprehensive Course in Analysis free with any purchase of the complete set. Researchers (mathematicians and some applied mathematicians and physicists) using analysis, professors teaching analysis at the graduate level, graduate students who need any kind of analysis in their work. There is no doubt that graduate students and seasoned analysts alike will find a wealth of material in this project and appreciate its encyclopedic nature. There is no need to belabor the point that this is a fabulous set of texts and will be a smash hit in graduate programs with good taste and good students willing to work hard and ready for exposure to mathematical culture of a wonderful sort. In addition to being a fine mathematician and teacher of mathematics, Simon is something of a raconteur (in the best sense of the word) with a strong interest in history. The books are peppered with historical asides and human interest material, and this feature adds to their readability. Indeed, they are beautifully and clearly written and certainly make for a major contribution to the literature at the intended level and beyond. When I learned that the AMS (which is to be congratulated with this publication) was launching this series by Barry Simon, I, of course, expected a great deal. I was by no means disappointed; these books are terrific.